In Ohio, The Trust for Public Land is working to protect valuable shoreline habitat and public access to Lake Erie. 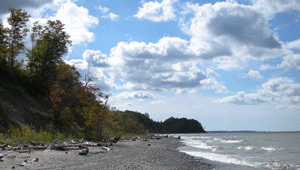 In 2012, we conserved 139 acres at Lake Erie Bluffs, including habitat important to rare, threatened, and endangered plants and wildlife. Species documented on the land include bald eagle and willow flycatcher. In addition to safeguarding scenic wetlands and meadows, the project opens up new shoreline access by providing nearly a quarter-mile of natural lakefront. The property is now managed by Lake Metroparks for natural resource protection and public enjoyment.